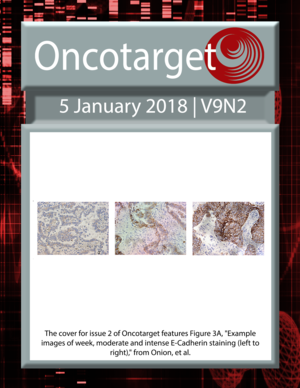 The cover for issue 2 of Oncotarget features Figure 3A, "Example images of week, moderate and intense E-Cadherin staining (left to right)," from Onion, et al. Targeting altered Nme heterooligomerization in disease? Differential expression profile of CXCR3 splicing variants is associated with thyroid neoplasia. Potential role in papillary thyroid carcinoma oncogenesis?